I was Anne Shirley growing up. I memorized every line of The Lady of Shalott – all ten pages. I treated everything like a scene from a play and tried to look on the bright side of everything unless it was beautifully gothic and dramatic to be tragic for a moment. Gilbert Blithe was the closest thing I’d ever seen to a Prince Charming, and I dreamed of being a writer. The main difference was that, unlike Anne, I prayed for red hair. Yeah…. Oh, and I dreamed of falling off the ridge poll of a roof (so I practiced balancing on ours like a n00b) only I had already decided that I would NEVER decline help from my own version of Gilbert, whoever that turned out to be. Obviously when I had finished reading those books, I had to find anything else by Miss Montgomery to pore over. This lead me to theEmily of New Moonbooks. These I devoured. I was actually in love with the character Teddy for a while, saw much of myself in the protagonist, Emily, and wanted her life. In terms of what real-life lessons I took from the books, what I got wasn’t a lot: never trust the creepy jealous mother of your true love to pass love letters between the two of you, do NOT entertain affections from guys old enough to be your father, and the idea of writing letters to yourself in the future. Emily writes letters to herself ten years in the future, but I knew I was too impatient to wait that long, so I went for five years instead. And GUESS WHAT?! 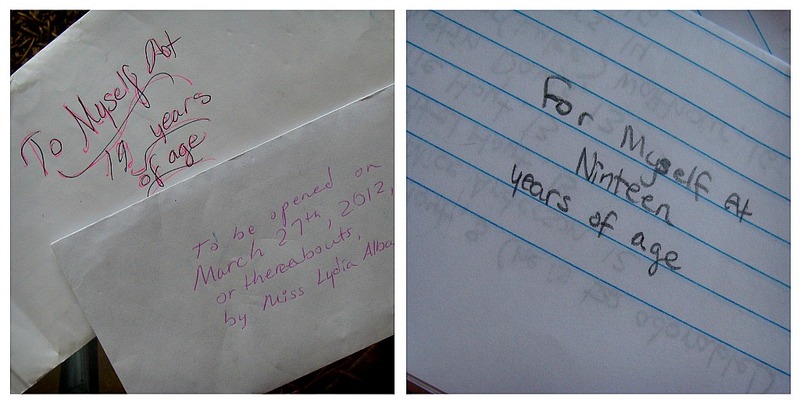 Today, being my nineteenth birthday (w00t) was the day I opened the two I wrote when I was 14!!! Oh my word. Made. My. Day.